While there is yet no official announcement on new routes as part of Network Direct, Dublin Bus officials have been in contact with bus drivers about proposed changes. It does appear the 25A route will remain as originally proposed. The 151 will terminate at Kisogue Train Station which is a major disappointment to commuters. Kisogue is at present not operational and Irish Rail have yet to announce it opening. It is unlikely that it will open until at least the first phase of Clonburris is built and occupied (still going through planning phase). It would have far more sense to bring the 151 to Foxborough as had been indicated. There now is no bus connectivity to Clondalkin/Crumlin area from any part of Lucan/Adamstown. 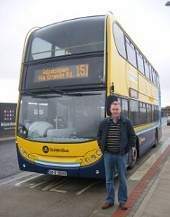 It also appears that the original 25B route will not be reinstated another big disappointment despite a large number of submissions seeking it’s reversal, Dublin Bus intends to proceed with the 25B service through Foxborough. The slight alteration to the 25B route from the plan on Dublin Bus website is; after the 25B leaves Adamstown it will continue down the Newcastle Road as far as Superquinn before heading back to original route via Esker Rd and then Griffeen Avenue. The only plus that I can see from this is that there will be an off peak service through most of Lucan every 15 minutes. While this is not an official announcement the fact that bus drivers have been informed of these routes it is a good indication that these are the routes they intend to implement. I would suggest that people make contact with Dublin Bus on these changes. ‹ The Boeing 787 Dreamliner will make its international debut at Farnborough Airshow.